What lessons can be learned from land navigation? Looking back on my first experiences in the Army and browsing through Army Field Manual 3-25.26 Map Reading and Land Navigation, I found some simple truths that can help get a person from point A to point B. People have been gleaning wisdom from military practices for centuries. Whether it is Sun Tzu’s The Art of War or a leadership seminar outlining the Battle of Gettysburg, corporate executives are continuously on the hunt for ways to separate themselves from the competition and lead their organizations into the future. I remember reading field manuals in the Army, but I never looked at the deeper philosophy they could provide. I only read and learned on a superficial level for the next test. Twenty years later, I may be going back to my roots. It shows you what is where. It shows you where you are and where you want to go. It will show you all the obstacles between you and your destination. It will inform you of the distance and give you an idea of what it takes to get there. A map is a great tool as long as you know how to read it. Like life, the two critical things you need to know is where you are and where you want to go. If you don’t know where you are, you are going to have to do some searching to find yourself. If you don’t know where you want to go, you are going to have to decide on that too, so you don’t find yourself wandering about. If you want to get where you are going, then study your map. Recognize the features on the map and compare it to your surroundings. Use all of the information available to you so that you may reach your objective. Where are you headed? What is your mission in life? You have to be able to identify the target before you can aim for it. I didn’t always know where I was going. Through my early adult years, I was just meandering about with no specific direction. I was a dabbler. I felt I could do anything, be anything, and I failed to aim for just one thing. Once I got an inkling of what my “calling” in life was, I started travelling in that direction. My progress was slow. At times, I think it is still slow. But I am not worried. We all travel at different paces. I may not be where I want to be, but I will get to the right place at the right time. Once you have your map and a little direction, you need a compass. It will point you where you need to go. A good compass will not lie to you. It will always point you where you need to go. But a compass, like a map, is just a tool. You have to know how to use it. You have to know that the magnetic north on a compass is not the same as true north and not the same as the north on your map. You have to realize its limitations and make the necessary adjustments. Recently, I watched a Jim Rohn video on YouTube. He made a few statements that had a profound effect on me. First he said, “Five years from now you will arrive, the question is where.” Visualize all the places you could go. Are any of them the actual objective, or closer to the objective? There are many places I could be five years from now but only one place I really want to be. The other thing he mentions is, “You will go the direction you are facing.” Become an expert with your compass, and you will find that you are always going in the right direction. Simplicity is key to your navigation. Executing an overly complex plan has a greater chance of failure which could result in the loss of valuable resources (time, energy, etc.). The simpler you can keep your plan, the greater chances you have of success. Identify your obstacles and find a way to overcome them. Identify your milestones and find a way to meet them. Regardless of the length of your route, your primary goal is to get there as efficiently as possible with as many resources as you can keep. 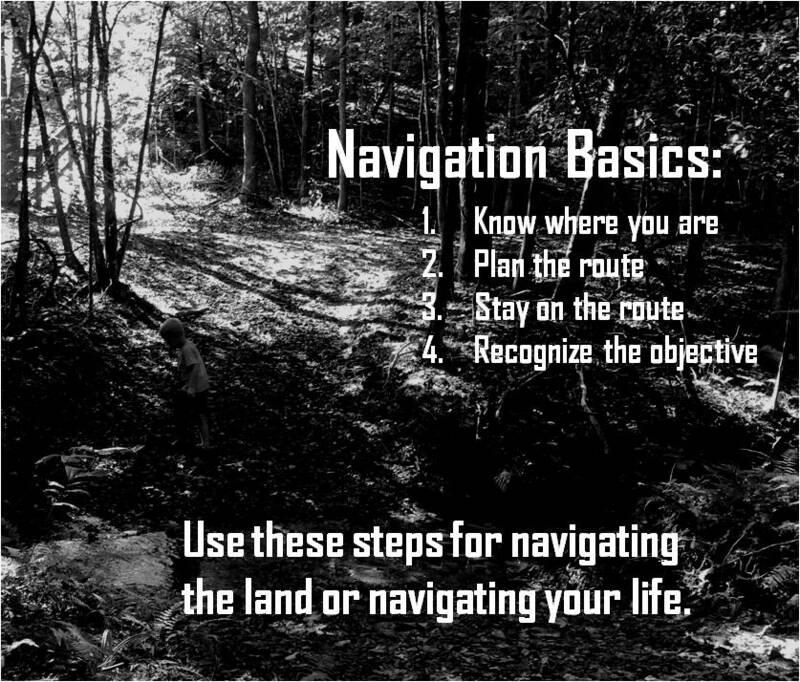 It is the basics whether in land navigation or in life navigation. You must know where you are, make a plan, stick to the plan, and recognize your objective once you get there. There are so many tools available to us. As we advance technologically, those tools make our ability to get to our objective much easier than any other time in history. The only question is how far are you willing to go. The farther the journey, the more time, effort, and energy will be required of you. But with persistence and a continual eye on your map and compass, you can reach your destination.